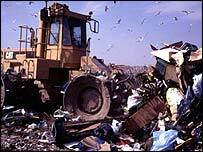 Every year, 1.5 million old, but working, computers are buried in landfill sites. Now, an impending EU directive could mean these discarded machines, and many others, enjoy a more useful life. 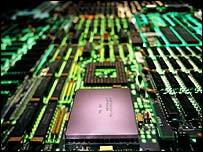 The Waste Electrical and Electronic Equipment (Weee) Directive makes electronics firms responsible for what happens to the gadgets and devices they produce once people have done with them. The Weee directive forces hi-tech firms to find greener ways of making electronic goods and obliges them to help recycle what they make once they are discarded. The Weee directive comes into force in the UK in early 2008. Jon Godfrey, director of Life Cycle Services and Weee expert, said the main burden of the directive fell on electronics firms and could add more than £65 to the price of producing computers and other electrical goods. "When you use a product somewhere you will be paying for its disposal and recycling at the end of life," he said. He added that the directive would also affect every company using computers. It demanded that companies dispose of their ageing computer stock responsibly. Few bits of a computer go to waste. Currently only 35% of computers were being disposed of ethically and responsibly, said Mr Godfrey. The target for recycling computers in the Weee directive is 70%. Between them UK firms and homes buy around 6.5 million PCs per year. Mr Godfrey said this ambitious target would put pressure on British recycling businesses. "There's not enough capacity in the UK to cope with that step change," said Mr Godfrey. "One of the big challenges in the recycling market is that there does not seem to be enough demand for the materials that recyclers are generating," he said. 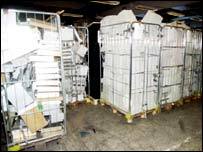 Often, said Mr Godfrey, recycling was not necessarily the best action to take with an old computer, particularly if a long journey had to be made to pick up or drop off the discarded machines. Because of this the directive was likely to boost the numbers of computers refurbished and re-used, said Mr Godfrey. "Re-use is a very sound environmental proposition," he said. Tony Roberts, head of Computer Aid International, said the directive could mean that far more computers reached developing countries in projects that help to foster technology skills. Mr Roberts said that in 2002 Computer Aid refurbished and sent overseas more than 5,000 PCs. By 2006 Mr Roberts said Computer Aid wanted to be handling up to 100,000 PCs per year, the majority of which would be freed by the Weee directive. He said that Computer Aid had deals with many firms, such as DHL and BA, to take away their old machines and use them in development projects. Mr Roberts said once it got hold of old machines it cleaned them up, made sure they were working and deleted all the information on them. Data protection regulations meant that computers had to be wiped of any information that could be used to identify customers. Mr Roberts said it installed the Linux operating system and open source software on the machines to cut the cost of maintaining the software. Computer Aid is shipping computers to projects in South Africa, Uganda, Kenya and Nigeria and many of the machines are going in to schools. Mr Roberts estimated that 99% of schoolchildren in developing countries left school without touching or seeing a computer in the classroom. "The multiplier effect of putting in a very simple technology that means little to us means an enormous amount to someone who has not used the stuff," said Colum Joyce, e-business strategy manager of DHL.